Low Carb Crackers, Flaxseed and Parmesan recipe. 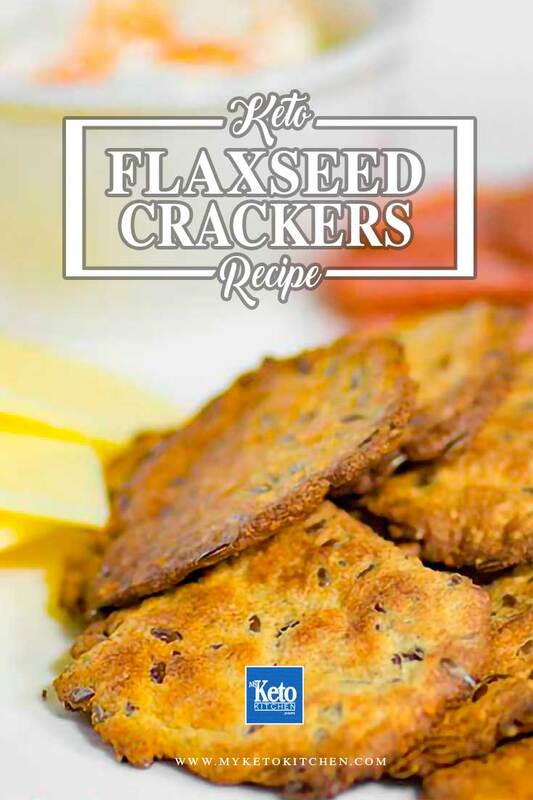 Our Low Carb Crackers recipe made of flaxseed and parmesan cheese are a great snack. They are quite plain in flavor. Which makes them a superb vessel for cheese, dip and cured meats. Try them with our Guacamole Recipe here. With their crispy texture, you’ll find it hard to stop yourself from eating the whole batch! 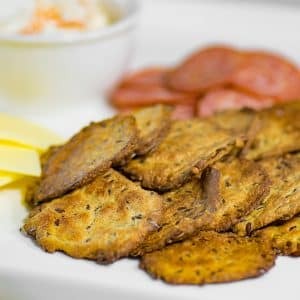 This recipe makes approximately 65 keto flaxseed low carb crackers. 5 crackers is a 1 serving, the low carb crackers recipe card reflects 1 serving which is 5 crackers or 1/13 of the total recipe. Preheat fan forced oven to 200C/390F. In a bowl combine the golden flax meal, flaxseed and parmesan and mix well. Add the water and egg and stir vigorously until a firm dough is formed. Ensure that all dry ingredients are combined. 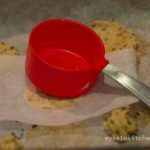 Tear off teaspoon sized balls and place on a lined baking tray, cover with a small square of parchment paper and used a flat-based object to flatten the dough out to 3/4in/2mm thick. We found a measuring cup to work best. Bake the crackers for 8 minutes, and then turn over and bake for another 2 minutes. You may need to batch cook depending on the size of your oven and baking trays. After all the crackers have been baked, turn the oven off and return all the keto flaxseed crackers to the cooling oven to dry out and crisp up for 20 minutes. Our Low Carb Crackers are a great Keto Snack. They are quite plain in flavoring and a superb vessel for cheese, dips and Keto friendly cured meats. After all the crackers have been baked, turn the oven off and return all the crackers to the cooling oven to crisp up for 20 minutes. To make a larger batch of this Low Carb Crackers recipe adjust the servings above.